I'll be honest. Back in the early 00's during the last teen pop boom in America (aka my youthful days of yore), the boys in 98 Degrees were somewhat tertiary in my boy band music listening habits. (First came *NSYNC, obviously; then came 5ive, because I was a bit of a "rebel" when I was 13; and then came soulful 98 Degrees.) However, I am proud to say I owned all three of their albums (I don't count Christmas records...and neither should you), saw them live in concert (co-headlining with Britney Spears at the New York State Fair with No Authority and my beloved PYT opening) and even owned a "JEFF" necklace from Claire's (yes, I also owned a "JUSTIN" one for my fave *NSYNCer...they probably still sell those now...except it's for a different Justin....sobs quietly). Hence the silly grin that is plastered on my face when I hear word that the quartet will be officially reuniting for not just a one-off Today Show performance, but for potentially new music! (5ive is also on the comeback trail, so they say, but I'll take that for what it's worth because...well, it's 5ive.) This also comes on the heels of my own Twitter conversation with the real Jeff Timmons (@jefftimmons98 -- follow him now) -- not once, but twice. I know. I know. From Left to Right: Jeff Timmons, Drew Lachey, Justin Jeffre & Nick Lachey. A Boyz II Men-esque (complete with spoken intro by bass-voiced Justin) co-written by Robin Thicke. Here is a Boy Band/Stevie Wonder collaboration you can stand behind (I'm looking at you, Jonas Brothers). If Stevie were to collaborate with anyone, it made the most sense to work with the 98 Bros anyhow, as they were also signed to Motown and made vocals their main spotlight. Comes complete with Stevie's trademark harmonica playing. It was also featured on the soundtrack to Disney's Mulan right alongside pre-"Genie" Christina Aguilera's "Reflection". Why this wasn't a single, I don't know, and I still lament it -- but I do know it was an immediate and instant favorite to my ears when I coped 98 Degrees & Rising in 1999. It also hinted to their push toward more up-tempo material in the boy band-soaked market of 2000. It was also produced by the TrackMasters and is HIGHLY reminiscent of their other main hit at around that time -- Will Smith's "Miami". I'll always be down for this version of 98 Degrees. I desperately wanted this to be the single to follow up 2000's "Give Me Just One Night (Una Noche)" (which went on to actually be their biggest hit) instead of the mushy ballad "My Everything" that Nick wrote about a certain now ex-wife of his that I remain to be quite fond of. Instead, it became single #3 and never charted on the Hot 100. Oh well, another loss for the American public. This one is ever relevant for that acapella-ish intro alone. As for the video -- good gravy, could this be any funnier? A video game concept. That's a good idea. (Sigh.) Oh well - as least the fact that Nick and Jeff were shirtless made "sense" (no complaints from the peanut gallery there). A Revelation album track that was hyped to fans because it was co-written by Drew, and actually features him singing lead vocals for a change. I liked it then because of that sizzling, urgent, swirly backbeat that sounds oh-so-very 00's boy band pop (think *NSYNC's "It's Gonna Be Me" with power punched chord changes). I like it now because I love the dark, smoked-out, sensual vocals. Oh, and it has a "rap" by Justin. What's up, KPOP? Let's label this as a note of caution to all of the girls (and boys) who came to age during the late 90's/early 00's teen pop boom and are just like me -- indulging in the boy bands/teen pop(/KPOP) of now, but often comparing it to how it used to be. Another early favorite from the Revelation album that never became a single, this one was co-written by my 98Hubby Jeff. Best Part? That bridge. And of course Because of You! Muwahahaha I was a BSB and a 98 degrees fan. Recently saw the NKOTBSBS concert last year for my BSB. I'm a diehard BSB fan, but I loved the late 90s boyband craze. Those were some solid pop music days. 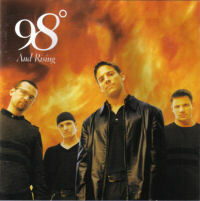 One of my favorite songs from 98 Degrees is "My Everything." And you know what's better than Donghae, my current bias, and one of my fave boybands?